I think I’ve tried every ‘natural’ or ‘eco’ laundry detergent under the sun. We get the kinds that have no optical brighteners, no dyes, and are fragrance free. 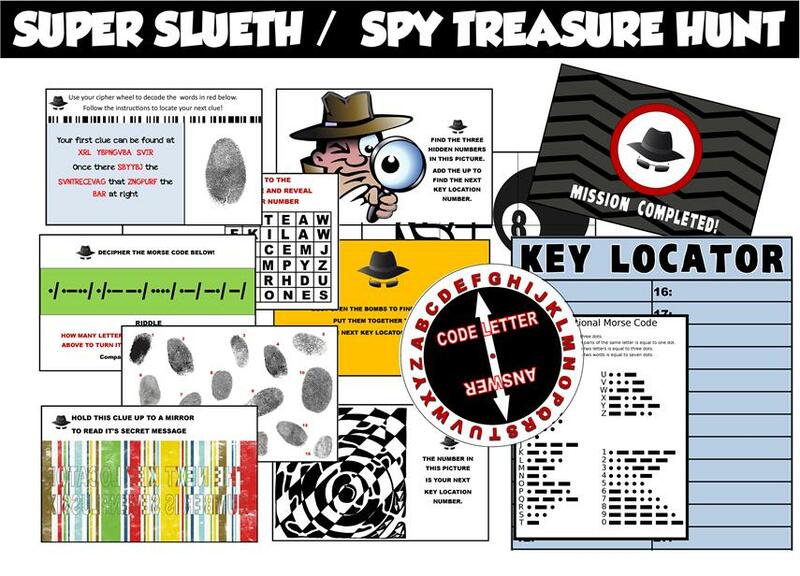 While most do a decent job, it always feels like something is missing. Whether that missing thing was a fun natural scent, or just the feeling that your clothes aren’t super clean, I kept on looking. About a month ago I was introduced to yet again a new ‘green cleaning’ detergent. Of course I wanted to give it a try, but I took it with a grain of salt as I’ve been through plenty to know that I know what I like. 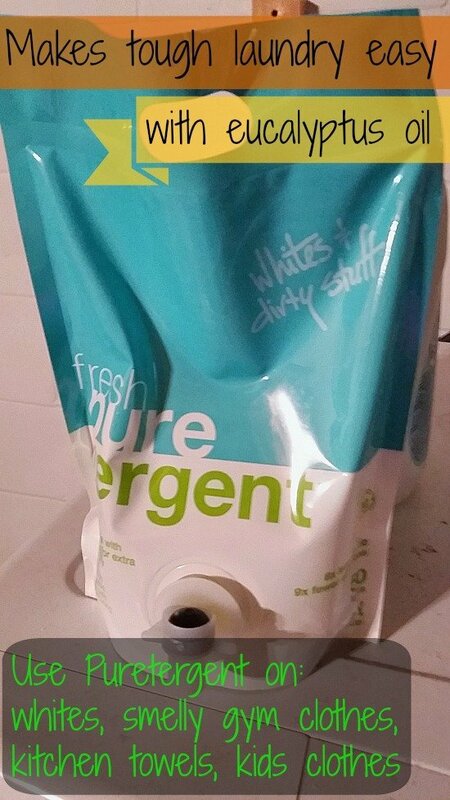 So when Puretergent sent me a few samples to try I put them through the wringer — really. You see I wash cloth diapers. Dirty, smelly, pee-soaked cloth diapers. They stink when they go in, but I don’t want them stinking when they come out. I want them clean, because a clean diaper makes a happy baby and a happy mamma! Plus who wants to sit around all day smelling like you just got out of the barn-yard?! So the results you ask? The clothes and diapers actually smelled clean — usually with a green type laundry soap there are no scents. Which scent free is okay, but for those of us who like a fresh scent once in a while this is a great alternative. They use only pure essential oils to scent so you know there is nothing artificial causing the smell. The prominent scent in the Pure variety smelled like tea tree oil to me, but it says it is eucalyptus in there so maybe that is what it was? The Gentle variety has a touch of aloe vera in it, so it is gentle on even sensitive skin. It is a liquid, with a spout, in a bag. Seemed weird to me at first too, but then I got to thinking about how much plastic waste is saved from landfills by using this method! You can even get a pouch hook to hang the pouches on the wall for convenience. The clothes I washed seemed pretty clean, but I guess that is something that is hard to measure in any tangible way? While my diapers did seem to get clean, there was a bit of funk leftover (I had been needing to strip my diapers prior to trying this and once that was done I didn’t notice the funk any longer, however, at that time I did also start pre-washing with this and then my main wash was a cloth diaper detergent). I haven’t really tried it on hubby’s sports clothes (stay-dry) so I’m not sure how it fares with that type of clothing. 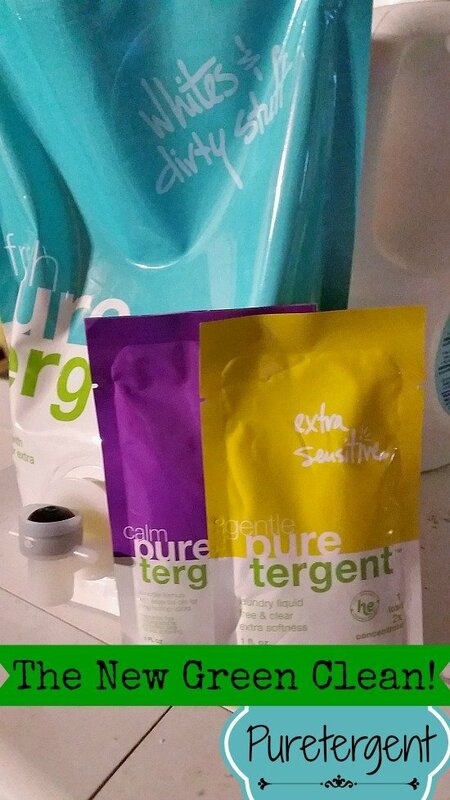 Overall I like the Puretergent, I love the fresh scents due to the essential oils, and I like the convenience of the liquid in a bag. Want to learn more? Check them out on their website or on Facebook! PreviousThe ONLY reusable hooks you will ever use again! NextFacebook Fan Celebration – Four Winners!